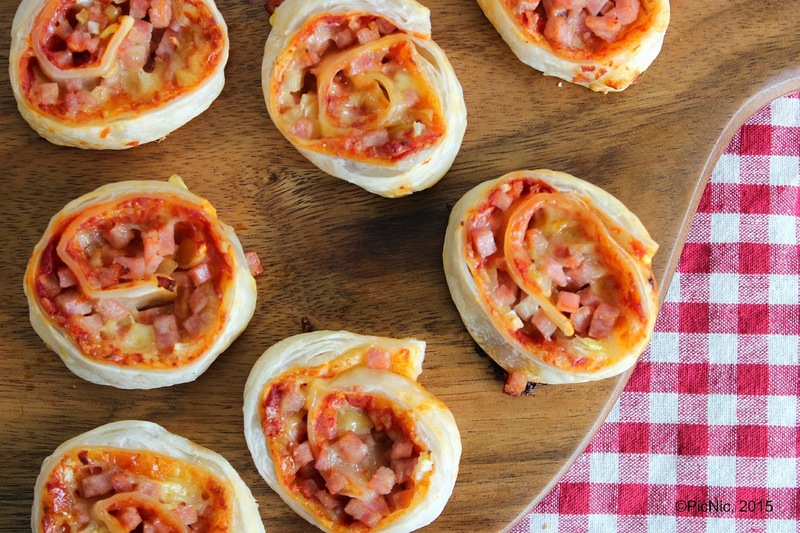 Pizza Pinwheels make a great party snack. They are simple to make and loved by everyone young and old. 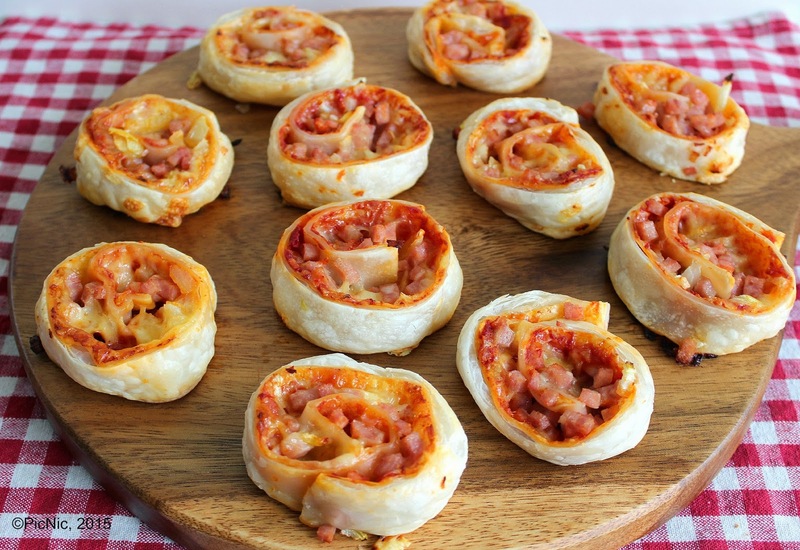 These pinwheel are a great snack idea for kids birthday parties, or anywhere that you need to take a bit sized snack. The great thing about these delicious little morsels is that they taste just as good hot or cold and you can mix up the filling however you like. 1. Preheat oven to 200C (400F). Line a baking tray with baking paper. 2. 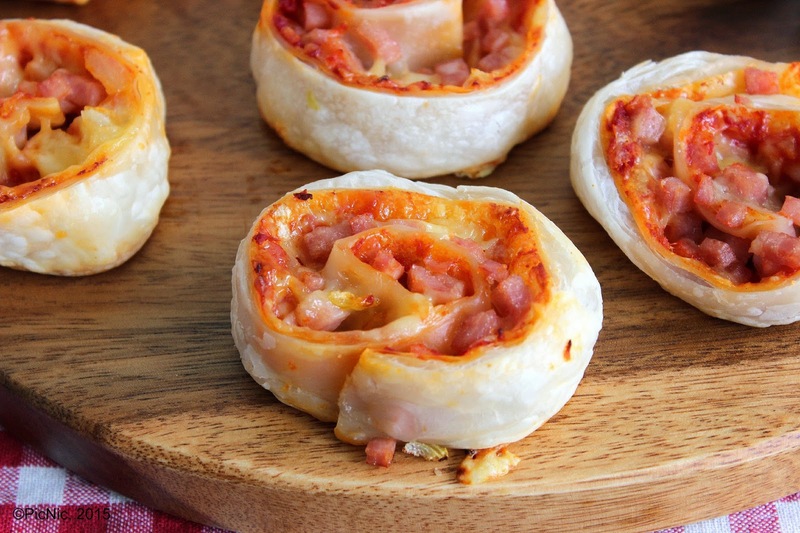 Spread tomato paste and garlic over each sheet of pastry, sprinkle with cheese, onion, and ham. Leave about 2 cm on one end as the mixture with spread when rolled. 3. Roll the pastry into a log and cut into even sized pieces. Place on the baking tray and bake for about 20 minutes, until the pastry is cooked and the cheese is melted and golden. These would be perfect for the Superbowl parties that will be happening this weekend. Great recipe. Your pinwheels make me want to throw a Super Bowl Party. 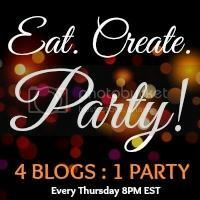 I'll be keeping these in mind for future parties, though! YUM. These look perfect for game day! Love it. How easy and delish do these look?! Great snack for the big game coming up! I just adore these Nicole...they look so fun and yum!!! I am a complete sucker for pizza! They look terrific! Nicole these looks sooooooooo tasty and fun!! I could literally eat pizza for every meal, every day and now as an appetizer!! I'm loving these and they would be perfect for Superbowl parties!! I love these!!! Cute, simple and so much better for you than the frozen variety. Great for big game party coming up. Puff pastry makes life so much easier! This looks delish!!! I love how easy these are to make and they look scrumptious! Oh wow! Such a wonderful recipe. Easy! And I bet they are super delish! 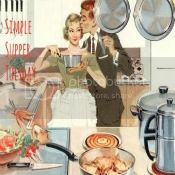 I've yummed your recipe for later! Thanks! Sounds like a perfect recipe for Super Bowl! Great game day food...my family would love these! These will be brilliant to devour during the Cricket World Cup games! 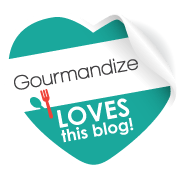 I'm so pleased that I found your blog through Tastespotting. Hi Michelle!! 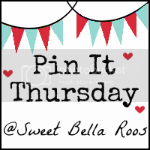 Thank you so much for stopping by :) I am always so delighted to hear from other NZers! I'm down in Dunedin. Enjoy the cricket, it's sure to be fantastic! 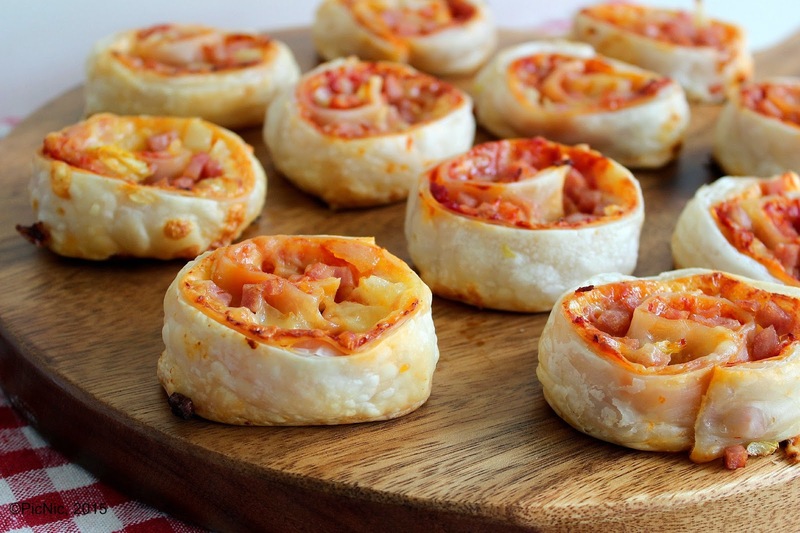 Perfect finger food little pizza! I'll try to make this on the birthday party of my little princess! Thanks.